Confession and absolution. It's something I didn't realize how much I missed until I found it again. In the Orthodox Church, as with most historic traditions, private confession to a priest is considered part of life. It's not something my wife and I were raised with, and not something that was initially comfortable to us when we first practiced it as Lutherans 10 years ago, but over time it became something we cherished. We fell out of the habit when we ended up in a parish that did not really emphasize confession, but that is to my shame, for my Pastor at the time assured me he would hear my confession and pronounce absolution any time I wished. I was simply too lazy and slothful to do that which my soul needed me to do. In the Orthodox Church confession is not "mandatory" in the sense that you don't have to go every so often, or whenever this or that happens -- there are guidelines but no real strict rules about when to confess. But it is certainly "mandatory" in the sense that it is expected. We were expected to confess before our Chrismation. We also confess in preparation for communion (not weekly, but frequently), whenever we have particular sins that burden our consciences, or whenever we have committed some serious sin that needs to be dealt with before God in a more formal way than prayer and the Sacramental life. In short, no one tells us we have to go, but we are encouraged to go, and go often. In our parish, it's easy -- after Vespers on Saturday, we can ask our priest if he will hear our confession that evening. Or we can call him and show up early. Or during any weekday liturgy, or really at any time he is available. Before we began making use of confession about 10 years ago, I remember feeling awkward and self conscious at the thought of telling someone else the bad stuff I've done. Truth be told, I still am to an extent -- I definitely do not color my sins in confession as the people I've sinned against might were they to know the extent of my wrongs. That's something for me to repent of -- I should trust my spiritual father more. But the beauty of confession is precisely in the absolution, and whatever self-consciousness I might have while laying my sins before my priest departs when he prays over me and announces the absolution. O Lord God of the salvation of Thy servants, gracious, bountiful, and long-suffering, Who repentest Thee concerning our evil deeds, and desirest not the death of the sinner, but rather that he should turn away from his wickedness and live; show Thy mercy now upon Thy servant, John [my communion name, after my Patron Saint John the Apostle], and grant unto him an image of repentance, forgiveness of sins, and deliverance, pardoning his every transgression, whether voluntary or involuntary. Reconcile and unite him unto Thy holy Church, through Jesus Christ our Lord, with Whom are due unto Thee dominion and majesty, now and ever, and unto ages of ages. Amen. God it was who forgave David through Nathan the Prophet, when he confessed his sins, and Peter weeping bitterly for his denial, and the sinful woman in tears at his feet, and the Publican, and the Prodigal Son: May that same God forgive thee all things, through me a sinner, both in this present world, and in that which is to come, and set thee uncondemned before His dread Judgment Seat. And now, having no further care for the sins which thou hast declared, depart in peace. May Christ, our true God, through the intercessions of his most Holy Mother, and of all the Saints, have mercy upon us and save us, forasmuch as He is good, and loves mankind. The sense of comfort, the sense of having weight lifted from your shoulders after this Sacrament is indescribable. 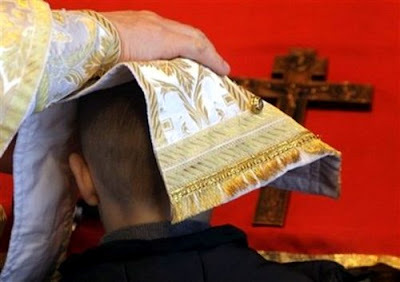 It is so wonderful that I feel for those who don't have the benefit of this Sacrament to comfort them when they are burdened by sin (though, truth be told, not nearly to the extent I pity those who have deluded themselves into thinking they have no sins worth confessing). And I wonder why more do not make use of private confession. It is one of Protestantism's great weaknesses in my estimation (I exclude confessional Lutherans and high Church Anglicans from this, since both have the rite in their tradition and make use of it in practice, and besides, neither really considers themselves "Protestant" to begin with). The most frequent objection I hear regarding private confession is "man cannot forgive sins, only God can!" I find this interesting, since there are only two places in the Scriptures this approximate phrase occurs -- Mark chapter 2 and Luke chapter 5. I'll use Luke as the example since the language is closer to this oft-repeated objection. Saint Luke records that after the absolution of the paralytic, "[t]he Pharisees and the teachers of the law began thinking to themselves, 'Who is this fellow who speaks blasphemy? Who can forgive sins but God alone? '"And what did Jesus do? He said "I want you to know that the Son of Man has authority on earth to forgive sins," and then He said to the paralyzed man, "I tell you, get up, take your mat and go home." And that's exactly what the paralytic did. So Jesus has authority to forgive sins, but that doesn't mean the priest does, right? Well, Jesus passes this authority on to His disciples expressly in John chapter 20. He said "[p]eace to you! As the Father has sent Me, I also send you,” and then He breathed on them and said “[r]eceive the Holy Spirit. If you forgive the sins of any, they are forgiven them; if you retain the sins of any, they are retained.” Jesus demonstrated His authority to forgive sins in Luke Chapter 5, and He passed on this authority to the Church in John chapter 20. Perhaps one reason the particular practice of individual confession and absolution finds such disfavor among most Protestants is the fact that it undisputedly developed a bit later in time. It is, essentially, a 3rd to 4th century development that began as a result of people who apostatized in periods of persecution and wanted to be reconciled to the Church. So what did the bishops do? They heard their confession, absolved them and imposed penance. I would argue late development is an insufficient basis for discarding the practice. After all, the practice of using hymnody in bar and verse format is quite a late development, but no one seems to have a problem with that. Further, the Sacrament of Holy Repentance has both Apostolic and Scriptural warrant. It's not as if it is a development that obscures the Gospel. Rather, like a beautiful setting for a precious stone, it displays the Gospel in all its glory! It is a shame to see such a beautiful and comforting practice fall into disuse. It is my prayer that it will be rediscovered among those who are encouraging the disuse. Thanks for the detailed explanation of the Orthodox rite. The use of the stole is interesting, since the Hebrew word for "atonement" seems to carry the idea of "covering." You're welcome, Joel. I wasn't aware the Hebrew word for "atonement" implied "covering." Thanks for pointing that out.